Traditionally focused on using and reusing materials, from worn clothing, draperies, feed sacks, blankets, and old newspapers, quilting has evolved to utilizing newly purchased materials and supplies. Make Do presents the outcome of Quilt Artist and nationally known teacher, Sherri Lynn Wood’s quilt challenge, which she put forth in August 2016. She challenged quilters to make one quilt top and back or a quilted item from salvaged clothing, linens, curtains or other household materials within the next year. 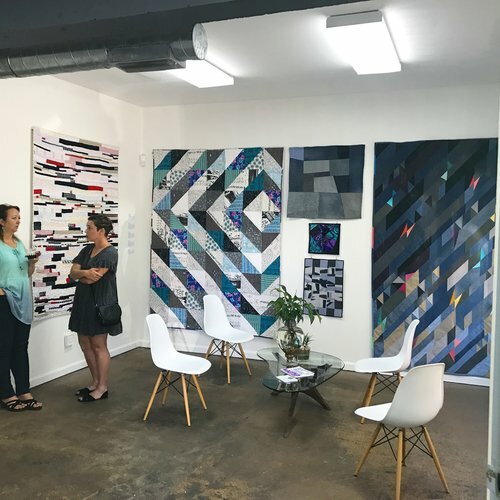 The South Florida Modern Quilt Guild embraced her challenge and showed their creativity and artistry, making do with a variety of inventive formerly reused or discarded items. Participating artists include Marya Amig, Patti Auten, Pat Bidol-Padva, Pam Chamberlin, Maureen Drudi, Susanne Ellman, Andrea Etkie, Linda Freyer, Jennifer Haugen, Deborah Krajkowski, Nicole Kaplan, Diane Moss, Charlotte Noll, Monica Peacock, Debby Schindall, Judy Shelton, Penny Stern, Kate Yates, Marilyn Zier-Ehren, and Brenda Zimmerman.